The best noodle soup we ate at her place. 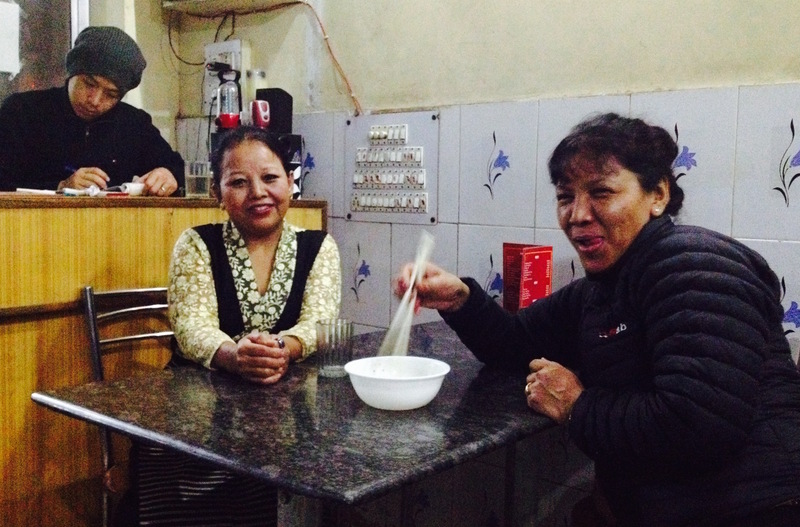 The Tibetan lady had opened her restaurant in New Delhi a few months ago. She cooks while her son takes care of the talking with the people because she doesn’t speak English. Unfortunately, she did not want me to take a picture of her in the kitchen. It would have been a fabulous one, with her in this beautiful dress standing at her cooking pots, surrounded by her co-workers, vegetable cutters and momo makers. Her restaurant was a small, modest location. It didn’t really fit to her. But it felt cozy and comfortable. I am sure, as soon as she has owned enough money, she will renovate her place. And her delicious noodle soup will be mentioned with five stars on various travel sites.